We welcome with great joy the new EAST ASIA GENERAL DELEGATION (The Philippines and South Korea) whose project now includes a facility for the elderly requiring assisted living only a few kilometers from the North Korean border. along the main street a block structure color camouflage, full of explosives, oversees South Korea from an invasion from the north. In this case it will be blown up to block the passage of military means. Now something has changed Won Cheol, in that stretch a few kilometers from the border: on June 10 was opened, a hundred yards away, a nursing home for the elderly and, without intending it, it will become a true bastion of peace for the zone. Weak as you like, but it’s there, quiet and authoritative: who will dare touch it? On the one hand the “walls” erected by the division, other than those generated by solidarity. The young brothers of the Congregation montiana in Korea have therefore doubled their field of action, after the Center for People with Disabilities “Stella Maris” Suwon operating for ten years. In the presence of more than three hundred people opened “Casa Monti” structure in which sixty guests with significant deficit of personal autonomy will be assisted by thirty operators. An army general, who attended the ceremony, ensured the collaboration of the many soldiers stationed in the area (compulsory military service is 22 months). 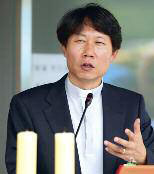 The bishop of the Diocese of Chun Chon, Msgr. Kim Hoi An Luca, blessed the premises and presided at the Mass, expressing his satisfaction with the activities of our religious. The civil society appreciates the commitment of the Catholic Church, which for the moment makes up 10% of the population and is growing annually by about two percentage points. Even the Buddhist community, stimulated by the example of Catholics, began to promote social work in an atmosphere of cooperation. 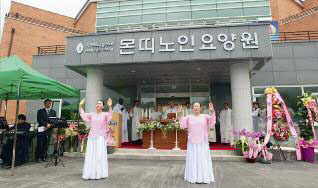 Mind and heart of this important initiative was Father Kim Kwang Su John Bosco, who, with his father Je Chun Chan Damian, started in 1997, the presence of the congregation in Korea. Today the community is made up of ten religious, three novices led by Father Thomas The Kim Seong – and five other young people … beginners. A religious missionary in Albania and two are studying in Italy. In the meantime, work began on a new task for people with disabilities in the city of Yongin. It is worth noting the strong participation of the faithful in these works, with the help of fundraising and organizational support. To self-finance, the Brothers of Korea have also promoted the sale of cosmetics of our “IDI Pharmaceuticals”, with a positive response from the people who buy them in front of churches or the Internet.